Former Missouri State pitcher Ross Detwiler looks to save the season for Washington today at 3:07 p.m. The Cardinals have one of the scariest lineups in all of baseball when they’re clicking like they have been in the last two games. That’s hasn’t been Washington’s strength this season and with their starting pitching stumbling, their inability to come up with big hits has been magnified in Games 2 and 3 and now the Cardinals look to finish off the Nationals today. The Cardinals have scored 20 runs in the last two games and are hitting .307 with runners in scoring position in the two wins. Meanwhile Washington is batting .125 the entire series, and .067 in the two losses. Washington is drawing four walks a game, but striking out 11 times per game. The Nationals are getting guys on base, but they’re not driving them in. Playoff experience from both pitching staffs is playing a key role. The Nationals are sending Wentzville, MO. native and former Missouri State Bears pitcher Ross Detwiler to the mound. 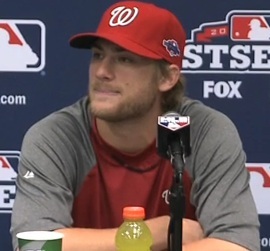 Detwiler, like Jordan Zimmerman and Edwin Jackson, faced the Cardinals late in the year and got punished. On his last start of the year, Detwiler got tagged for seven runs, three earned in 2.1 innings. The Cardinals are countering with Kyle Lohse. Before the Atlanta game, manager Mike Matheny said Lohse was not only the most consistent pitcher on their team, but perhaps in the entire National League. Lohse will try to use his playoff experience to his advantage.